We recently were invited to visit Hershey and Harrisburg in Pennsylvania, and while getting there was easy, the challenge was trying to figure out how to squeeze so much into one trip. If you think the Hershey area is just about chocolate (yes, it’s the home of that famous brand), you may be missing out on so much more. While Hershey attractions are numerous (and definitely worth seeing), the towns of Hershey and Harrisburg offer much more for families. 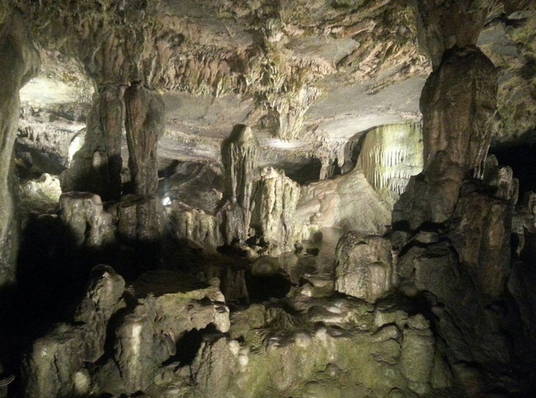 As we discovered, from museums to caverns there is much to see. Because we visited during the winter holidays, we also got to enjoy some special Christmas attractions. If you have a chance to visit the area – after all, Hershey and Harrisburg are just about two and a half hours from most spots in Northern Virginia – by all means go! Its proximity to us makes this a wonderful choice for a weekend road trip or longer. This year most school districts in Northern Virginia have a two-week winter break. If you’re in town and have a few extra days, take advantage of them and make a trip to Hershey. You don’t need to book a flight, hotels (at all price points) are plentiful, and if you want to celebrate the season, most special holiday attractions are open until December 31! Below is a recap of some of what we saw. The post below highlights nine attractions we visited over three days — (1) Pennsylvania National Fire Museum, (2) National Civil War Museum, (3) Indian Echo Caverns, (4) The Hershey Story, (5) Hersheypark Christmas Candylane, (6) Hershey Sweet Lights, (7) Antique Automobile Club of America Museum, (8) Hershey’s Chocolate World, and (9) Tröegs Brewery — plus reviews of three restaurants and our hotel. I will be writing more about these in detailed (individual) posts soon! Meanwhile, see our quick descriptions and mini-reviews of each of these nine attractions (including two holiday special events). 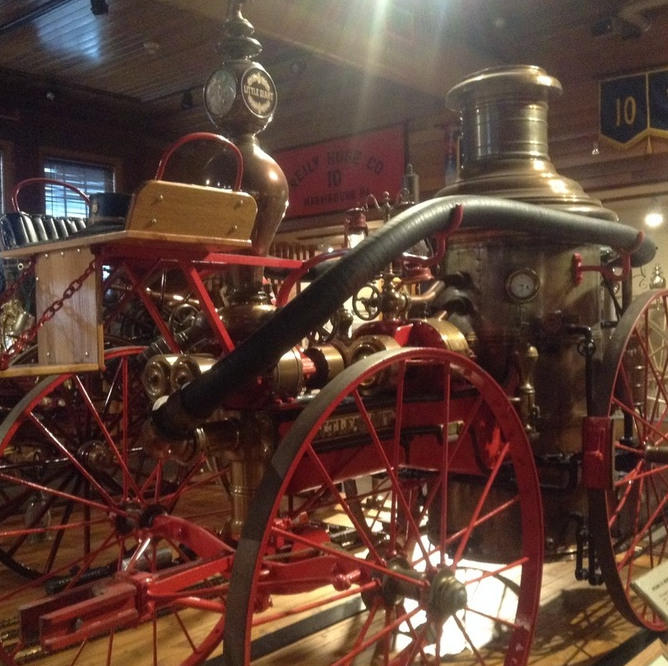 Housed in a former Victorian fire house dating to 1899, this “hidden gem” of a museum features a fantastic collection of antique firefighting equipment, artifacts, special displays and even a real working alarm room. The Pennsylvania National Fire Museum has exhibits on everything involved in fire prevention, from alarms to fire engines to hydrants, and the people who work in this field. The beautifully restored three-story building is in mid-town Harrisburg, with free off-street parking across the street. 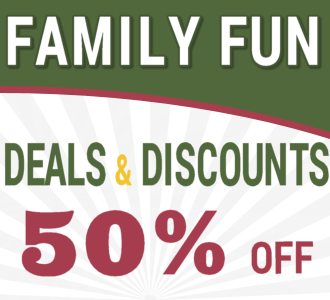 With lots to see and very low admission ($6 per adult, $5 per child, or $20 for two adults and all their kids), this is a bargain and a very educational option. You’ll see all kinds of equipment, life-sized displays of the horses that would take the firefighters to a job. Upstairs you’ll see the fully restored and operational alarm room, which was a unique feature, and a nice display of parade hats plus lots of memorabilia. 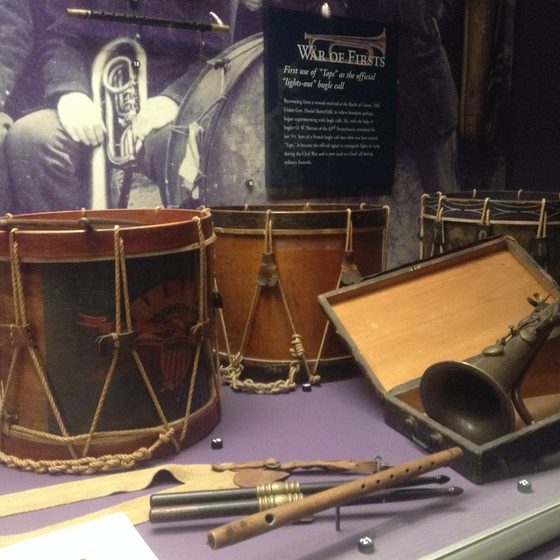 On a hilltop overlooking Harrisburg, the beautiful National Civil War Museum has more than 24,000 square feet of exhibit space and more than 3,500 artifacts. In fact, it is the largest museum in the world dedicated solely to the American Civil War. The mission of the non-profit museum is to tell both sides of the Civil War without bias. It also highlights the mindset of both the North and the South leading up to the war and the consequences everyone involved faced (this would be a good place to visit before going to the Gettysburg battlefields). Special exhibits include The Cost of War, Women in War, and Abraham Lincoln. For history buffs and Civil War enthusiasts (a museum employee says they get many re-enactors visiting), this museum is a must-see. This is not necessarily a “kid-friendly” museum in that it doesn’t have special features for them or hands-on activities and some of the displays may be too intense for young children. That said, my second-grader spent an hour with me at the museum with no complaints. He has been learning about Lincoln at school so this visit was a good way to enhance that recent education. Close to Hershey, the 440-million-year-old Indian Echo Caverns are always a comfortable 52 degrees and feature an underground labyrinth of tunnels, small lakes, and rock formations. We have been to many caverns before, especially here in Virginia, so I honestly had to wonder if I’d be impressed, but once we we walked into one of the grand rooms, wow, what a sight! Your 45-minute tour goes through the Indian Ballroom, the Blue Room, the Rainbow Room, Crystal Lake, and more. Even if you’ve been on cavern tours before, you’ll certainly enjoy Indian Echo. Your tour begins by going down some steep 70 or so concrete steps to the cave opening, where a tour guide provides a quick history about the caverns, the Indians who used it as a shelter, and “the Pennsylvania Hermit” who lived there. The paths at Indian Echo Caverns are mostly flat and very easy to traverse. As in any cave, condensation and small puddles can form, so there may be some parts where you’ll need to watch your footing, but it wasn’t slippery (please note: tours are not heelchair-accessible nor are strollers allowed due to the cavern formation). The caverns have a large gift shop with a good variety of items, including Indian crafts, a free petting zoo, and a playground for kids. Our first chocolate-related visit was at The Hershey Story. I’m very glad we did this fist, since it tells you all about Hershey: the man, the company, and the town. Here, you will learn how Milton Hershey went “from bankruptcy to brilliance” transforming chocolate from a luxury to an everyday treat. You’ll also learn about his many philanthropic endeavors, travels, and more. This bright, cheerful, and spacious museum just minutes from Chocolate World and Hershey Park offers something for all ages. Kids will love all there is to see, do, and touch. They can even make their own free Hershey Story “photo passport” at the “Xploroscope” machine right in the lobby. Some activities we enjoyed included the Workers Wanted exhibit, Chocolate Lab, and Chocolate Tasting. 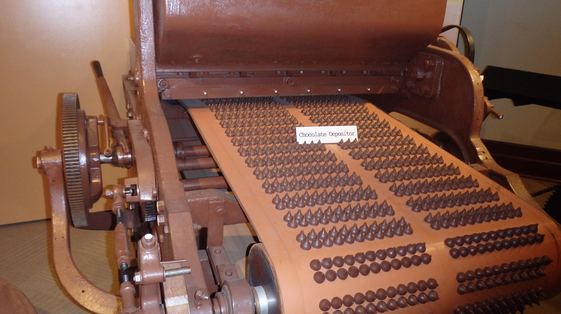 At “Chocolate Workers Wanted” (through May 31, 2015), you go through various stations as a “new hire” of Mr. Hershey. You can “roast” cocoa beans, push the bathtub truck, “knock out” chocolate bars, and with Hershey’s kisses. At the end, you pick which job you like best and how much it pays (or paid, back in the day). In the Chocolate Lab (separate fee), we discovered where cocoa beans are grown and how they are harvested and processed into the world’s most popular confection. This is a fun, 45-minute class where you design and create your own take-home chocolate treat! We also did a chocolate tasting at Café Zooka, with warm chocolate samples from six of the world’s finest cocoa-growing regions. Hersheypark is not just for summer! During the theme park’s “Christmas Candylane” days (through December 31), guests enjoy light displays, rides for all ages, festive decorations, holiday shows, visits with Santa and his reindeer, Hershey characters decked out in their holiday best, and more. 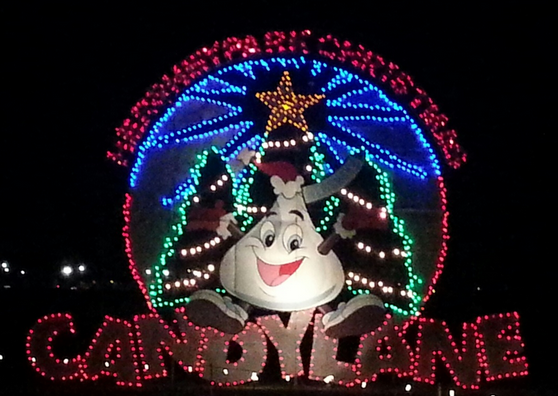 Christmas Candylane features more than 30 rides for all ages. No big roller coasters are open during this event, but you can still find many favorite family rides including the monorail, Skyview, carousel, Tilt-a-Whirl, Scrambler, and all the kiddie rides, and some more challenging rides like The Claw. And if you really miss coasters, there’s a small one you can ride: new in 2014, the Cocoa Cruiser at Founder’s Way is in operation during Candylane! This medium-speed steel family roller coaster is small enough to give young guests the thrill of a coaster for the first time, yet large enough for adults to enjoy its moderate twists, turns, and bumps. Other fun things you can do while at Candylane are to visit Santa, see his live reindeer in the stables, enjoy ice skating (skate rental fees are $2), and see two holiday shows: NOEL, featuring more than 150,000 dancing lights synchronized to your favorite Christmas music, and “Up on the Rooftop” in the Music Box Theatre, a fun play about happens when two determined kids stay up late to try to catch a glimpse of Santa; this plays several times a day. If you’re going to Hersheypark on the weekend during the holidays, or anytime during the regular season, arrive early enough to visit ZooAmerica as well. This year-round, 11-acre walk-through zoo is adjacent to Hersheypark and your admission is FREE on the same day you’re visiting the theme park. Hersheypark Candylane opens at noon on Saturdays and Sundays and since the zoo is open until 4:30 during this time of year, you’ll have plenty of time for both attractions. The zoo features more than 200 animals from five regions of North America, including bears, alligators, reptiles, birds, wolves, big cats, and more. After a busy day that ended with the excitement of Hersheypark Candylane, most families might have just called it a night. We’re not most families! Though we were tired, we still went to Hershey Sweet Lights that night, since we were right there. 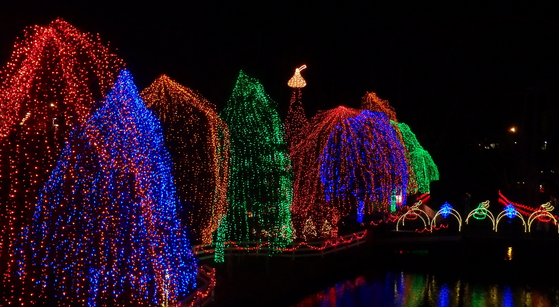 Sweet Lights (a seasonal exhibit through New Year’s Day) is just a very short drive from Hersheypark, is a two-mile holiday drive-through light spectacular featuring 600 illuminated, animated displays. We were there for a good half-hour or so, and it seemed never-ending: every time we thought it would be the end, there were more lights up ahead. This is definitely the most extensive drive-through light show we’ve ever toured. One different and very neat thing here was that they hand you (or your kids, rather) 3D glasses when you come in. Wearing these make the lights appear to have spinning snowflakes around them. The Christmas tree at the entrance looked especially cool, but all the other displays had extra pizzazz (heck, even the headlights and taillights of other cars could get that effect!). Be sure to borrow your kids’ 3D glasses for a bit to enjoy this effect, or bring 3D glasses from home, as they won’t hand you many at Sweet Lights (we were told they were for kids only). At the Antique Automobile Club of America Museum in Hershey you’ll find antique cars, buses, motorcycles, and memorabilia at this large and elegant museum that has visitors “travel” from New York to San Francisco (via themed exhibit rooms) over eight decades. If you’re a classic car enthusiast, this place is nirvana for you. Even if you’re not, you’ll marvel at the intricate details in these old vehicles and the marvelous condition in which they’ve been kept. 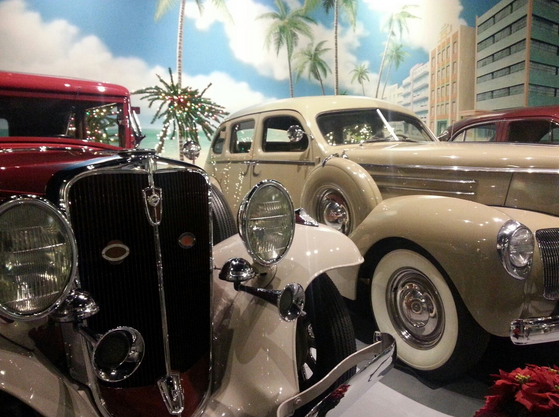 The exhibit rooms have painted walls and decorations to set the theme – on the main floor, you’ll “visit,” for example, 1900s Battery Park in New York, a 1940s gas station, and the 1930s Miami Art Deco district. The Museum collection has more than 150 vehicles, all of which have been donated. Exhibited vehicles are rotated regularly and at any given time, you can see 85-100 of these classic cars and trucks on display. The types of cars you’ll see range from the 1890s to the 1970s. You’ll also see a motorcycle exhibit, antique buses, an antique diner, and the 26-foot-long Hershey Kissmobile. Museum tours are self-guided so you go at your own pace, but friendly and helpful docents are always around to answer your questions and provide interesting facts beyond what’s on the exhibit signs. There’s also an interactive kids’ room downstairs, which is basically a big play area, good for younger children. I was a bit surprised at how much my son enjoyed this museum since he’s always just “okay” about car shows. In fact, one testament to how much he was enjoying it was that he wanted to stay longer, even though he knew our next stop was Chocolate World. Not the theme park, and not the museum, Hershey’s Chocolate World is a one-of-a-kind attraction. 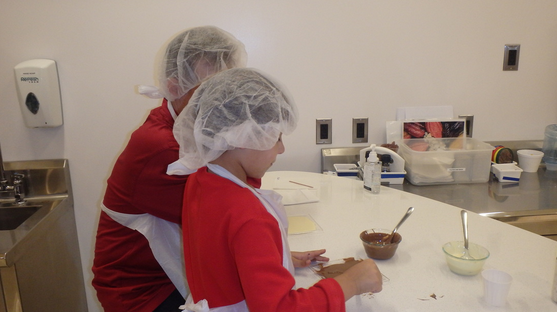 Here you can enjoy a free chocolate making tour, shop at a HUGE store for all things Hershey-related (not just the chocolate, but all other products by the company), make your own candy bar, and enjoy a 4D show. Admission is free but you’ll want to experience some of the fee-based attractions. We began with the Great American Chocolate Tour, a little free ride that takes you on a journey to see how cocoa beans become savory sweets. We then went to the Great Chocolate Factory Mystery in 4D show. This fun little “whodunit,” about 20 minutes long, really is 4D as you also smell the chocolate and enjoy other special effects (which I won’t say so the surprise isn’t ruined). It’s also interactive, as the characters on the screen will ask you questions and may even call you by name. Our final special activity there was the Create Your Own Candy Bar. This is a must-do, as it’s fun and educational, and you get a big take-home treat. Here you use real factory equipment to create your own chocolate bar! 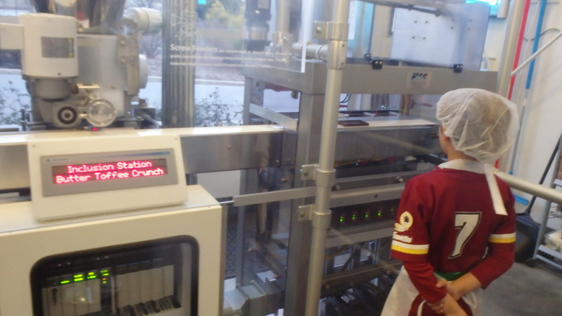 From designing what your wrapper will look like, to selecting the ingredients that go into your bar, you use touch screens at various stages to customize your bar, then watch (through Plexiglass) every step as your chocolate bar is created. Other fun options at Chocolate World include Tasting Adventure, Trolley Works Tour (a 75-minute historical tour of “Chocolate Town, USA”), or the Dessert Creation Studio. Chocolate World has a food court, ice cream shop, a Bake Shoppe with decadent treats and take-home goods. Our most unique dining spot was also a tourist stop: Tröegs Brewery. This independent brewery a short drive from Hersheypark and the Outlets at Hershey was named the sixth top brewery tour in America by USAToday and 10Best. This modern and huge facility – it’s 90,000 square feet – offers a 5,000 square foot tasting room that opens into an outdoor seating area. Beer enthusiasts can enjoy small group tours to see the entire production process and taste and smell the building blocks of beer from raw ingredients to the finished product. If you’ve got kids in tow or are short on time, don’t worry: the self-guided brewery tour (which we did) can be done at any time. Signs along the tour provide ample information, and the equipment is all behind glass so kids can’t run out beyond the tour area. We sampled beers and had dinner at the “Snack Bar,” the fast-casual restaurant portion of the brewery, which has an eclectic menu that is very reasonably priced. You’ll find items such as “venison and aged cheddar bologna with braised red cabbage, turnips, chestnuts, and pine butter toast,” “seared foie gras on peanut butter brioche with currant jam, apple chips, and sage,” and a “lamb burger on curried naan bread with fig chutney, honey goat cheese, lambs lettuce, carrot harissa, and fries.” We had the poutine, kids’ pizza, grilled cheese, and beef brisket. We especially liked the sandwiches and the Oktoberfest pretzel with cheese fondue and horseradish sauce, which was divine! Truly the best soft pretzel I’ve ever had, and now I shudder at the thought of ever having one of those generic pretzels at a sports arena ever again. Fenicci’s of Hershey, which celebrates its 80th anniversary in 2015, is an independent, family-owned, Italian restaurant loved by locals and tourists alike. 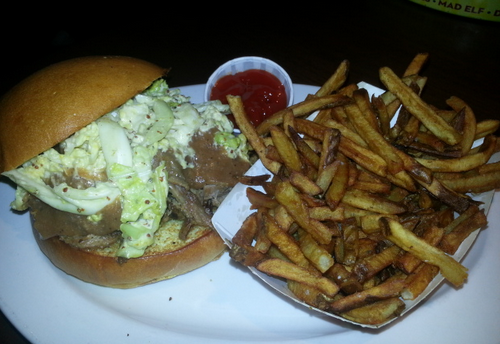 It had come highly recommended to us, and it did not disappoint. The menu is extensive – it boasts, for example, 18 appetizers and 23 specialty pastas – so if you’re indecisive when it comes to ordering, as I can be, it can be a bit overwhelming. Get there a bit early to give yourself time to browse through the many options. This also will give you an opportunity to check out the World Records wall. Phil Guarno, the owner of Fenicci’s, actually holds several world records, certified by Guinness! Food portions at Fenicci’s are generous. My husband enjoyed the veal parmesan while I had the marsala risotto, which was meatier and heavier than I’d expected, but very tasty. Our son opted for Fenicci’s famous “upside down pizza” which basically just puts the cheese on the bottom and the sauce on the top. Our food came out surprisingly quickly and our server was helpful in making recommendations. My only regret is that we were too full from lunch to make it next door to Phillip Arthur’s, a café and old-fashioned ice cream parlor (owned by the same family) for dessert. We’d been told to try “The Kitchen Sink,” nine scoops of ice cream with six toppings, topped with homemade whipping cream and cherries and “as many spoons as you’d like,” but that will have to be for next time! While we wanted to stick only local restaurants in Hershey to truly get a “taste of the town,” we couldn’t escape the convenience of a Friendly’s just a couple of minutes down from our hotel. Its menu of familiar foods and kid-friendly fare, plus the fast service and flexible hours, made this a great stop for us a couple of times. The first was a very, very late dinner when our busy itinerary had us fall asleep early, only to wake up at 9 pm starving. Nothing says “vacation” like heading out to dinner with the kids at 10 pm! Thankfully Friendly’s was open. Our other visit was for a late breakfast. We wanted it all: a good meal to fuel us through the day (since we likely wouldn’t have time to stop for lunch) plus in a comfortable setting plus delivered quickly. Friendly’s delivered on all counts. By the way, the chain also celebrates its 80th anniversary in 2015. Our “home” in Hershey during this trip was the Best Western Inn Hershey on Rt. 422 and Sipe Avenue. We had booked our trip on short notice and were glad to find availability at a hotel so close to everything. It’s just a short drive to all the Hershey attractions, Indian Echo Caverns, and more. This is a basic budget hotel with limited amenities, but in a great location and at a price that will work well for most families. We found it to be very clean, which is my top priority at any hotel I stay at, regardless of brand, location, or price. I was surprised to later learn that this hotel accepts pets. While I love that it’s pet-friendly, the fact that I had no idea is a testament to the hotel’s cleanliness. This Best Western has free Internet/WiFi, a small fitness room, and a small dining area with free daily breakfast (the usual cereals, muffins, and such, plus a waffle maker and yogurt). It also has a nice S-shaped outdoor pool with one end as a “beach area” with zero-depth entry and one of those “mushroom” water fountains (we visited in December so of course the pool was closed at this time). And the staff couldn’t have been any nicer! Both on arrival and on departure we had to make some changes and the staff was very accommodating, particularly on our final day when we needed more time and requested a late check-out. As much as we did on this trip, there was far more we could have seen (you really could spend a week in the area and never be bored). Some of the other attractions we would have liked to see, which we saved for a future trip, include the Pennsylvania Capitol Complex in Harrisburg, some of the 15 area wineries, area art galleries, the Midtown Scholar Bookstore (named one of “America’s Greatest Independent Bookstores”), Toys on the Square (a huge store with toys and collectibles from around the world), and Pioneer Tunnel Coal Mine (about an hour away), where you can tour a real coal mine that closed in 1931. Although everything we visited was in very close proximity to each other, hours of operation can vary greatly, so do some research before your trip to plan a target itinerary. Check the websites of attractions carefully, as many (especially the Hershey Chocolate ones) have extra activities for additional fees that, while fun, can add up quickly. All these places have gift shops with lots of merchandise. Budget some time and money for them, or set some ground rules with kids early on (or avoid the shops altogether) if you’re trying to stick to a budget. We visited all the attractions here in three full days but we tend to be very low-maintenance, we travel light, we’re very organized, and we have only one child. We also tended to have a big breakfast at the hotel and make dinner our other big meal, just snacking lightly in between throughout the rest of the day so we could spend more of our time exploring the attractions. If you need a lot of time to get ready in the morning, you’re in a big group, you don’t tend to plan out your day, you need to factor in diaper changes and/or naps for young kids, or you like to make every meal a formal dining event, you likely won’t get to do all the things we did in three days. The Hershey and Harrisburg area offer lots to visit all year long and offers special seasonal events; the next big festival is the Chocolate-covered February event with several festivities. 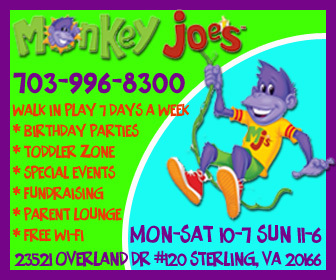 Since the area is just a little over two hours from Northern Virginia, so you can visit several times a year! Disclosure: We were guests of the Hershey Harrisburg Regional Visitors Bureau and Hershey Entertainment & Resorts Company. Though our visit was complimentary at all the places highlighted (which I selected to visit), all opinions are my own honest reflections. This article is my original writing, presented to reflect my personal experience and to suggest ideas for family travel. 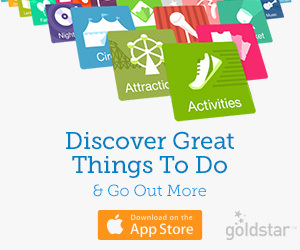 Share the post "Nine places for families to visit in Hershey and Harrisburg, PA"